Music for solo piano. Volume II / Grainger. Contents note: Mock morris -- The Sussex mummers' Christmas carol -- Handel in the Strand -- The hunter in his career -- The merry king -- Spoon River -- Harvest hymn. Includes biographical introduction by Barry Peter Ould. Copyright held by Schott & Co. Score: The merry King : for winds, harmonium and piano / by Percy Aldridge Grainger. 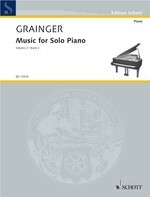 Score: Mock Morris : for piano, popular version / by Percy Aldridge Grainger. Score: Handel in the strand : clog dance : version for piano solo / by Percy Aldridge Grainger. Score: The Sussex Mummers' Christmas carol : for SAATBarB choir a cappella / Percy Grainger ; arr. Dana Perna. Score & Part: Harvest hymn : for violin and piano / Percy Grainger.